Kyasanur Forest Disease (KFD) has provided a good example of how some typical difficulties might be faced while enforcing preventive measures in ethnic groups, especially for tribal groups that reside in secluded or forested areas. 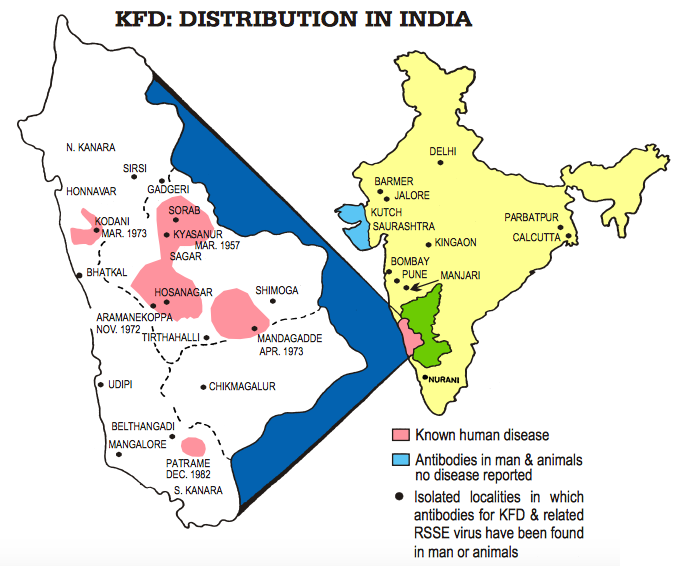 KFD was first detected in Shimoga, Karnataka, in 1957, and since then has caused sporadic outbreaks limited mainly to forested areas. Interestingly, the virus was first identified when an investigation was conducted in the mass mortality of black faced langur (Semnopithecus entellus) and red faced bonnet monkeys (Macaca radiata). Though the case load has never been very high in case of human outbreaks, and has been considerably well handled given the restrictions of working in these settings, this has remained as a major concern over the years. Before jumping into the unique problems associated with the control measures, a few words about the disease itself. KFD is caused by the KFD virus, a member of the family Flaviviridae. It is a hemorrhagic fever and has typical symptoms shared by other similar disease causing agents of this family, which sets in following an incubation period of 3-8 days, though longer incubation periods are also possible. The disease is commonly carried by rodents, though it has usually been monkeys that have been incriminated in causing the spread to humans. The virus is transmitted through the bite of an infected tick, most commonly Haemaphysalis spinigera. As in the case of many zoonotic infections, KFD is also a dead end infection in man and human-to-human transmission is not possible. The virus has been shown to have trans-stadial transmission in ticks, though trans-ovarian transmission has not been reported (except in Ixodes petauristae). In 2014, the Cholanaikkan tribes residing in Karulai and surrounding areas have been the worst hit with the outbreaks of KFD. Several members of this forest-living tribe were diagnosed to have been suffering from the disease, and sporadic cases kept emerging. The ICMR, in association with the NIV has been involved in the development and distribution of a vaccine against the disease (notably the CDC factsheet fails to mention this!) which has shown to have a moderate success rate, evoking an antibody response in as much as 70% of those inoculated. However, the control measures have had to face a lot of hurdles mainly because of the unwillingness of the tribe members to adopt the preventive strategy. News reports speak of patients leaving hospital against medical advice while under treatment for KFD, and a very lukewarm response to vaccination initiatives in general. Although special vaccination camps were held in the affected area, the response rates remained low. Perusal of the news reports seem to show that there is, in general, a reluctance to adopt the preventive measures against this disease although it steadily keeps claiming victims every year. KFD virus, as a bio-safety level 4 pathogen, is an organism of great public health interest; however, the complex human behavior associated with the control measures adopted against this agent is equally interesting. 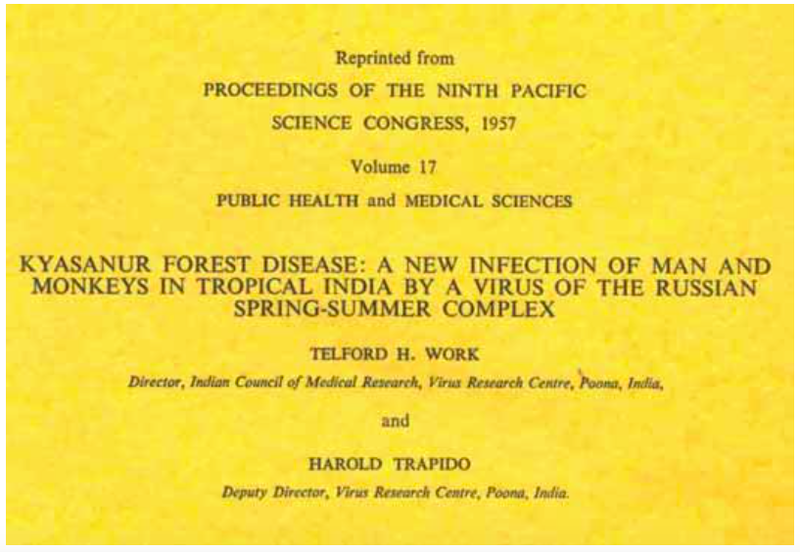 Tags: infections, kfd, kyasanur forest disease, outbreaks, viral hemorrhagic fever. Bookmark the permalink.